Dave Mott was born in 1942 in Cleveland, Ohio. After graduating from North Dakota State University with a bachelor's degree in mathematics, he entered Officer Training School on August 16, 1965, and was commissioned a 2d Lt in the U.S. Air Force at Lackland AFB, Texas, on November 10, 1965. Lt Mott next completed Undergraduate Pilot Training and was awarded his pilot wings at Webb AFB, Texas, in December 1966, followed by T-38 Talon Instructor Pilot training at Webb from January to March 1967. He served as a T-38 instructor pilot with the 3560th Pilot Training Squadron at Webb AFB from March 1967 to March 1971, and then attended Air Liaison Officer/Forward Air Controller training and OV-10 Bronco Combat Crew Training from March to August 1971. His next assignment was as an OV-10 forward air controller with the 20th Tactical Air Support Squadron at Da Nang AB, South Vietnam, from September 1971 until he was forced to eject during a combat mission and was taken as a Prisoner of War on May 19, 1972. After spending 313 days in captivity, Capt Mott was released during Operation Homecoming on March 27, 1973. He was briefly hospitalized to recover from his injuries at Scott AFB, Illinois, and then attended pilot requalification training and F-4 Phantom II Combat Crew training before serving as an F-4 pilot and as Assistant Operations Officer with the 7th Tactical Fighter Squadron at Holloman AFB, New Mexico, from February 1974 to July 1977. Maj Mott attended Air Command and Staff College at Maxwell AFB, Alabama, from July 1977 to July 1978, and then served on the Tactical Evaluation Team with Headquarters Allied Air Forces Central Europe at Ramstein AB, West Germany, from August 1978 to September 1981. His next assignment was as an F-4 pilot, instructor pilot, and as an operations officer with the 23rd Tactical Fighter Squadron at Spangdahlem AB, West Germany, from September 1981 to July 1983, followed by service as an operations officer with the 52nd Tactical Fighter Wing at Spangdahlem from July 1983 to July 1984. 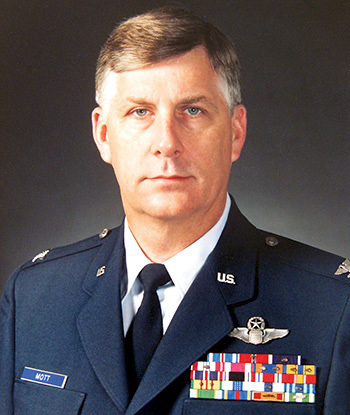 Col Mott served as Chief of the Fighter Operations and Training Division with Headquarters 17th Air Force at Sembach AB, West Germany, from July 1984 to July 1987, and then as Director of Combat Operations with Allied Tactical Operations Center Sembach at Sembach AB from July 1987 to July 1989. 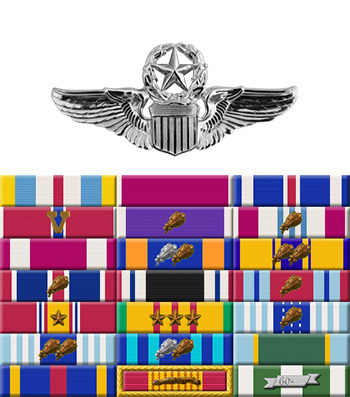 His next assignment was as Assistant Chief of Staff of the Offensive Operations Division with the 4th Allied Tactical Air Force at Heidelberg, Germany, from July 1989 to July 1992, followed by service with the Interim Combined Air Operations Center at Sembach AB from July 1992 until his retirement from the Air Force on December 1, 1995. Captain David P. Mott distinguished himself by extraordinary achievement while participating in aerial flight as a Forward Air Controller in Southeast Asia on 25 February 1972. On that date, while piloting his lightly armed reconnaissance aircraft over a heavily defended segment of route structure in Laos, Captain Mott discovered a large convoy of supply laden trucks. Despite extremely poor weather and intense antiaircraft artillery fire, Captain Mott directed tactical fighters onto the hostile vehicles and destroyed two trucks, heavily damaged two trucks, and produced two medium secondary explosions and numerous sustained fires. The professional competence, aerial skill and devotion to duty displayed by Captain Mott reflect great credit upon himself and the United States Air Force.